Overlap exists in the clinical experiences of specialist nurses treating inflammatory diseases in dermatology, rheumatology and gastroenterology. Established in 2005 and led by top UK specialist nurses, Arena for Immunology is a cross-therapy nurse education programme that aims to empower specialist nurses to make a difference in the delivery of immunology care. About 150 specialists attend Arena national events yearly, and hundreds more are reached through regional vehicles. Utilising latest academic thinking, developed in partnership with an advisory board of psychologists, Arena has been evolved into a multichannel programme that changes clinical practice and improves patient outcomes. There are immunological links between immune-mediated inflammatory diseases (IMIDs) in dermatology, gastroenterology and rheumatology, with patients often presenting with multiple conditions. Specialist nurses play a vital role in managing IMID patients, and clear overlaps exist in clinical experiences and needs. However, the ever-evolving NHS presents significant challenges to UK specialist nurses, and they often feel demotivated. Led by a multidisciplinary Steering Committee (SC), Arena for Immunology launched in 2005 as a cross-therapy nurse education programme. In 2011, AbbVie, the SC and Lucid began work to evolve Arena into a programme that advances real-life clinical practice in immunology nursing with a specific focus on appropriate IMID treatment; tight disease monitoring, and improving communication with patients and across the three specialities. 4. Celebrate successful Arena-inspired changes through Arena ‘Network for Change’ (NfC), where Arena participants submit posters of real-life Arena-inspired clinical innovations that have made an impact in their practice. 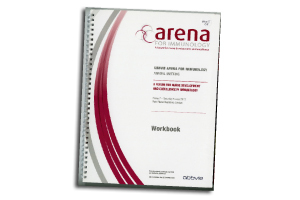 Overall, between 2011 and 2013, an average of 99% rated Arena as ‘good’ or ‘excellent’; and 98% would recommend Arena to colleagues.